Photo Sharing - Video Sharing - this week! It was so cute! They were playing and Makenzie would lift her head up so her PT put her next to her and told her that they couldn't play until she lifted her head and right away she put it up and they didn't have an more head problems!!! She is such a stinker!!!! She understands so much!!! She is also sitting a ton better and when reminded to push while in sitting,she will. I am so proud of her!!!! I was gone for almost 4 weeks all day doing my CNA class and got to see her PT for the first time yesterday. I felt so good because the first thing she said to me was they all of her therapist could tell how much I was doing with Makenzie because while I was gone it took them much longer to get through her tone at the begining of the session!!! She was taken care of very very while while I was gone but all of the extra work that I do with her was validated! In PT on Fri we took Kenzie out to the new trampoline and she loved it! Even though the trampoline was given for the boys, I think Kenzie will get a ton out of it too!!! Her PT showed the boys how to do a bunch of new trick on the tramp too! It was a great time!!!! 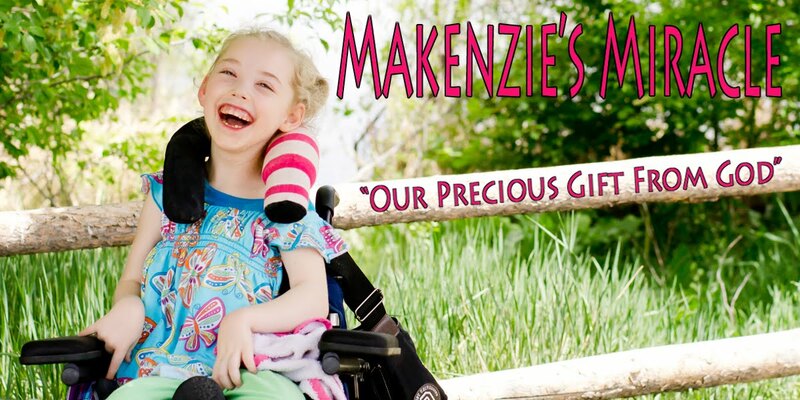 Keep praying for Princess Makenzie!!! We are so greatfull for all of our prayer warriors!!! Thank you!! !